England V France, London, UK - 10 Feb 2019. 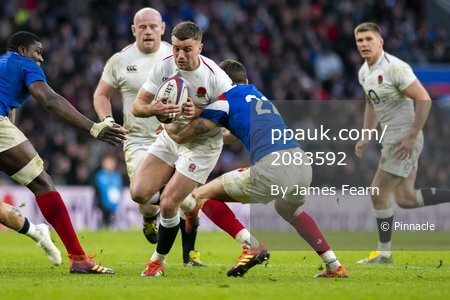 Caption: George Ford of England is tackled by Romain Ntamack of France during the Guinness Six Nations Round Two match between England and France at Twickenham Stadium, Twickenham, London on the 10th February 2019. [Photo: James Fearn/PPAUK].